It’s December 2, the beginning of Advent, and a wonderful parade of old friends will be arriving throughout the day. First will be the procession that moves around the Advent wreath in the center of the old farm table. New candles each year brings it a freshness, but it’s been with us for over 2 decades. The family tradition for this day is to set up a collection of weary travelers right there by the front door. This tiny collection of the marginalized came to us many years ago, person by animal by angel, in a Smithsonian Advent calendar. Courageous, sweet Mary will be pregnant for another 3 ½ weeks. 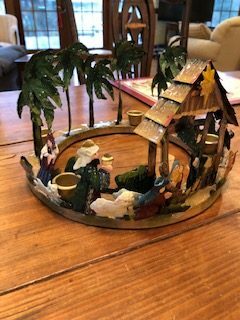 This is my favorite because it represents the mysterious “both/and”that Advent is: now and not yet; outcast and king; the world turned upside down. It’s the waiting that I love. I didn’t use to love it. As a child, it was too hard. But now, it’s my favorite. I set the intention to cherish each December day, reading the daily scripture, noticing what moves deep within me as I sit in silence for 20 minutes each morning. Sometimes what stirs is the ‘to-do list’….but the older I get, (or the older the “kids” get, now all in their 30’s) the more likely the time of preparation will be a time of interior rest and waiting. Thomas Keating said: “The greatest thing that separates us from God is the thought that we are separate from God. If we get rid of that thought, our troubles will be greatly reduced.” I carry this with me throughout December, savoring the waiting while knowing that right now, in this very moment, God is here, God is active, God is loving. Spirit is here, Spirit is active, Spirit is loving. Spirit is within me and within everyone I see every day. With a deep interior knowing that I hope God continues to cultivate, each day has glorious potential to be filled with surprises if I will but notice. What attitude will I choose today to help my eyes be like God’s eyes? Each day is assured to be saturated with love. Will I see it? Where will I see it? In the actions of those who commute on the same roads with me; in the glories of the natural environment; in the shining eyes of those whom God loves? Will I notice? It’s all part of the waiting. 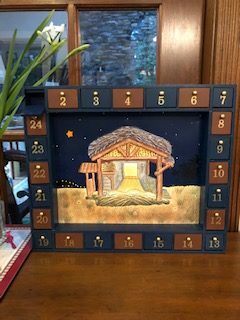 The invitation of Advent: Waiting. Expectation. Anticipation. Fulfilled in every moment that is Now. Thank you to our Spiritual Director Francie Thayer for this reflection. To learn more about Francie’s work visit The Retreat House.